Before we spend many hours researching a company, we’d like to analyze what insiders, hedge funds and billionaire investors think of the stock first. We would like to do so because the elite investors’ consensus returns have been exceptional. In the following paragraphs, we find out what the billionaire investors and hedge funds think of Ulta Beauty, Inc. (NASDAQ:ULTA). Is Ulta Beauty, Inc. (NASDAQ:ULTA) a healthy stock for your portfolio? The smart money is turning less bullish. The number of long hedge fund positions shrunk by 4 in recent months, and the company was in 40 hedge funds’ portfolios at the end of September. Not only that the stock is slowly losing interest from smart money investors, it has also failed to attract many of the wealthiest hedge fund managers out there (if you want to see which companies are favorites for billionaires, read the list of 30 stocks billionaires are crazy about: Insider Monkey billionaire stock index). Even though losing investors, and not having many of the big hedge funds among its holders, are not good signs for the stock, we won’t stop with our analysis here. We need more data to make a conclusion on whether Ulta Beauty, Inc. is a good buy, or not. So, we continue. In the financial world there are a lot of indicators market participants put to use to size up stocks. A pair of the most useful indicators are hedge fund and insider trading signals. We have shown that, historically, those who follow the top picks of the best money managers can outclass the S&P 500 by a significant margin (see the details here). “We initiated a position in Ulta Beauty during the quarter. Ulta is one of the largest beauty retailers in the U.S., typically located in off-mall spaces. For several quarters, the company reported comparable store sales numbers that seemed to defy the general retail space and at the same time seemed unsustainable over the long term. The Company was growing much stronger than peers in both top line sales and bottom-line earnings, with the former running at a strong double-digit rate. Valuation levels of Ulta started to come in around mid-2017 as comps were beginning to slow from the peak mid-teens. However, the Company continued to put up strong sales growth and management was sticking to their +20% earnings growth target through 2018. Current comparable store sales are running in the high single-digits, still much better than their peer group. Ulta is expanding their digital footprint and investing in their e-commerce business, which has now risen to 10% of total company sales (a year ahead of target), allowing them to compete and grow in the all-important online space. U.S. While this market has seen steady growth of low single-digits in mass cosmetics and mid- to-high single-digits in the prestige beauty space, Ulta is reporting bottom line growth in the 20% range, which means they are gradually capturing market share from their peers. Their store growth model currently targets 1,400 to 1,700 stores over the next several years, which would result in store base growth in the high single-digit to low double-digit range as they open approximately 100 stores on average per year. Having ended the most recent quarter with just over 1100 stores, this leaves years to their store growth model alone. The company’s target customer is the “beauty enthusiast,” a segment of shoppers that is the most engaged in the category with high expectations for their shopping experience. They represent 57% of women and 77% of spend in the category, crossing all aspects of demographics, age, race, and ethnicity. Ulta believes their share of beauty enthusiasts is 30%, which leaves plenty of room to capture a larger share of this group. Ulta also has a loyalty program which consists of nearly 30 million members as of the end of the most recently reported quarter. The program has shown strong member retention and 90% of total company sales come from loyalty members. Thesemembers tend to shop more frequently as well as spend more than nonmembers. Ulta, in addition, is working to increase shopper engagement. Only 10% of loyalty members are shopping both online and in store. As Ulta converts these shoppers to a more omni-channel guest, they have found that their transaction spend increases dramatically – nearly 3X. Even with RiverPark’s positive view on the company, we still haven’t collected enough information about it to make our final call on it. Which is why, we will now take a look at the key hedge fund action regarding Ulta Beauty, Inc. (NASDAQ:ULTA). 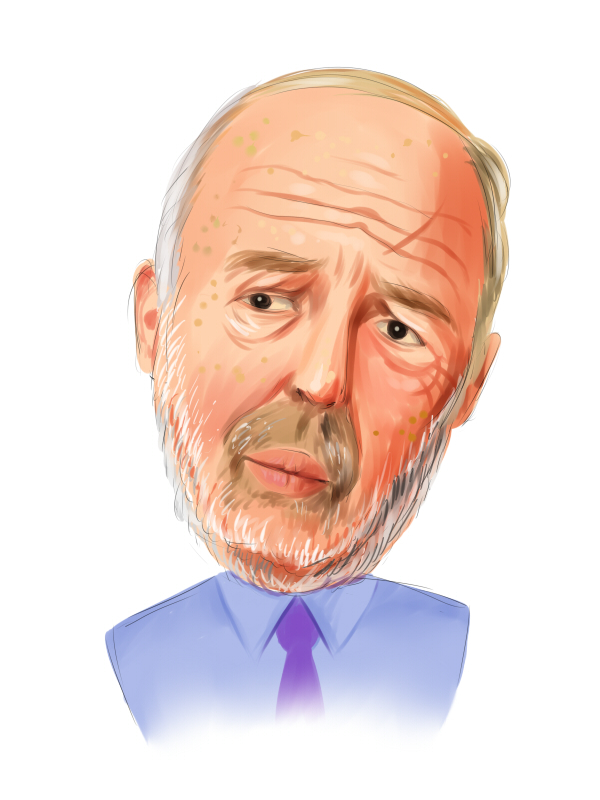 How are hedge funds trading Ulta Beauty, Inc. (NASDAQ:ULTA)? Heading into the fourth quarter of 2018, a total of 40 of the hedge funds tracked by Insider Monkey were bullish on this stock, a change of -9% from the second quarter of 2018. 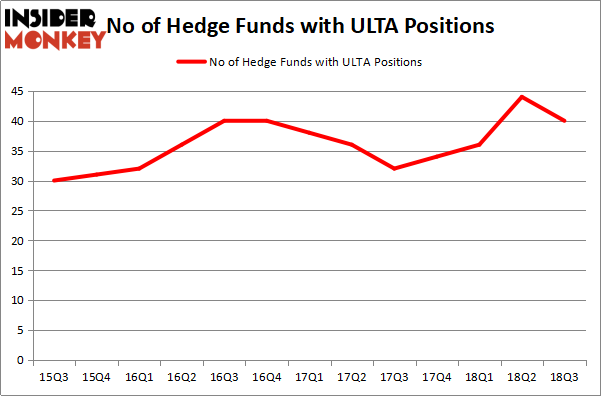 On the other hand, there were a total of 34 hedge funds with a bullish position in ULTA at the beginning of this year. With the smart money’s sentiment swirling, there exists a few noteworthy hedge fund managers who were boosting their holdings substantially (or already accumulated large positions). The largest stake in Ulta Beauty, Inc. (NASDAQ:ULTA) was held by Renaissance Technologies, which reported holding $130.6 million worth of stock at the end of September. It was followed by Two Creeks Capital Management with a $108.8 million position. Other investors bullish on the company included Hitchwood Capital Management, Columbus Circle Investors, and Two Sigma Advisors. Seeing as Ulta Beauty, Inc. (NASDAQ:ULTA) has witnessed declining sentiment from the entirety of the hedge funds we track, it’s safe to say that there lies a certain “tier” of funds that elected to cut their entire stakes by the end of the third quarter. It’s worth mentioning that Jacob Doft’s Highline Capital Management dumped the biggest investment of the 700 funds tracked by Insider Monkey, worth about $79 million in stock, and Richard Barrera’s Roystone Capital Partners was right behind this move, as the fund sold off about $24.1 million worth. These transactions are intriguing to say the least, as aggregate hedge fund interest was cut by 4 funds by the end of the third quarter. Let’s also examine hedge fund activity in other stocks – not necessarily in the same industry as Ulta Beauty, Inc. (NASDAQ:ULTA) but similarly valued. We will take a look at Discovery, Inc. (NASDAQ:DISCA), DISH Network Corporation (NASDAQ:DISH), Cardinal Health, Inc. (NYSE:CAH), and Principal Financial Group, Inc. (NYSE:PFG). All of these stocks’ market caps are closest to ULTA’s market cap. As you can see these stocks had an average of 27 hedge funds with bullish positions and the average amount invested in these stocks was $930 million. That figure was $831 million in ULTA’s case. DISH Network Corporation (NASDAQ:DISH) is the most popular stock in this table. On the other hand Principal Financial Group, Inc. (NYSE:PFG) is the least popular one with only 15 bullish hedge fund positions. Ulta Beauty, Inc. (NASDAQ:ULTA) is not the most popular stock in this group but hedge fund interest is still above average. This is a slightly positive signal but we’d rather spend our time researching stocks that hedge funds are piling on. In this regard DISH might be a better candidate to consider a long position.